Once you have a stretched canvas, the next step is to prime the canvas so you can start painting. A primer seals and protects the support, makes the canvas less absorbent, helps the colors stand out, can provide a smoother surface with enough tooth for the paint to bind onto, and is, therefore, an excellent surface for both acrylic and oil. With a ready-made gesso suitable for both acrylic and oil painting, priming is very easy. Large house-painting brushes 3 inches wide, foam brush, or a paint roller for an even coat of paint. For smaller canvases use smaller versions of these tools, but the largest possible to do the job. Make sure you buy a bottle of gesso that is suitable for both acrylic and oil painting. This dries very fast and is painted directly onto the stretched canvas. Stir the container very well before using. Do not skip this step! Decide whether you're going to apply one or a few coats of gesso. One coat gives a rougher finish. Two coats are recommended for a good overall finish. If you are applying only one coat, use the gesso as it comes out of the bottle for added thickness and surface coverage. If you are going to apply several coats, dilute the gesso of the first coat with a little bit of water to a thickness of a heavy cream. Different brands of gesso have different viscosities. You may find that you need to add more or less water depending on the brand of gesso you are using. You can also add a bit of acrylic gloss medium with the water to help prevent cracking of the gesso, although this is not often a problem. Using a clean, wide brush or roller apply the gesso directly to the stretched canvas in even strokes. Work from the top to the bottom of the canvas, in parallel strokes from one edge to the other. 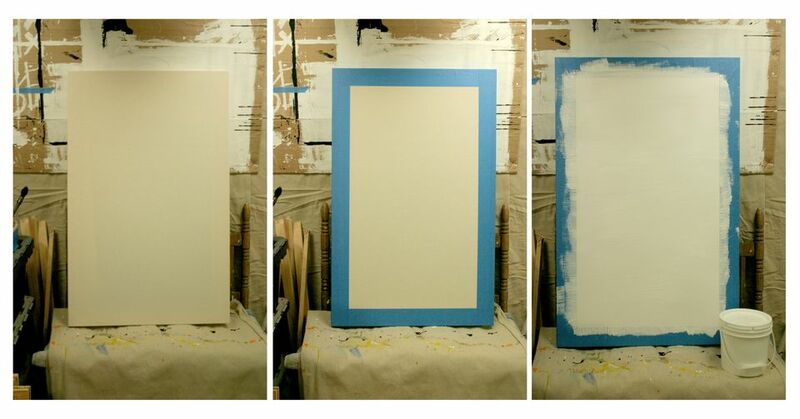 Remember to paint the edges of the canvas, too, with each new layer of gesso. Let the first layer dry for a few hours. You may want to move your painting slightly at this point so it does not become stuck to any newspaper or newsprint underneath it. In the meantime, wash your brush out immediately with soap and water. Once gesso has dried on a brush, it won't come out. When the first layer has dried (it is no longer cool to the touch) you can sand it lightly with a fine sandpaper if you want a smoother surface. If applying two coats, apply the second coat in the direction perpendicular to the first coat. This coat can be thicker than the first coat. Let the coat dry, and sand again if you want a very smooth surface. You can add yet another layer of gesso if you want. The choice is yours. You can also add a little acrylic paint to your gesso if you want to add a hint of color to create a colored ground on which to do your painting. A cheap decorating brush works well, but wash it several times before you use it as the hairs tend to fall out. If you want the brush to be thinner, cut off some of the hairs with a pair of scissors. A top layer of gesso diluted thinly with water and acrylic gloss medium will help create a smooth painting surface. Gesso can also be used to prime hardboard or paper, both of which make good supports on which to paint with oil and acrylic. If your canvas is not too big you can put pushpins into the back corners of your canvas stretchers to provide legs for your canvas to rest on. You can also add texture to the final coat of gesso by adding acrylic gel mediums or by adding other elements such as sawdust or sand.